In to the light ! 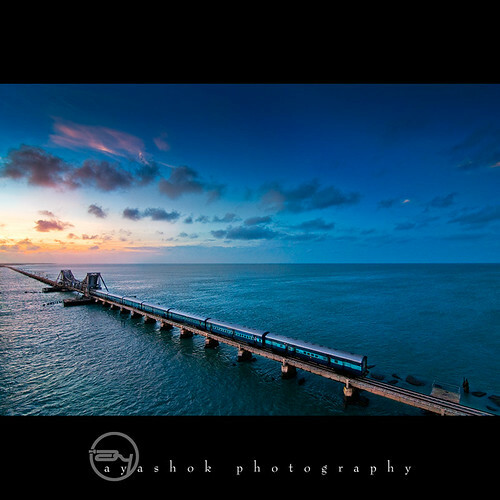 The Pamban Bridge (Tamil: பாம்பன் பாலம்) on the Palk Strait connects Rameswaram on Pamban Island to mainland India. It refers to both the road bridge and the cantilever railway bridge, though primarily it means the latter. It was India's first sea bridge. It is the second longest sea bridge in India (after Bandra-Worli Sea Link) at a length of about 2.3 km. From the elevated two-lane road bridge, adjoining islands and the parallel rail bridge below can be viewed. The railway bridge is 6,776 ft (2,065 m) and was opened for traffic in 1914. The railroad bridge is a still-functioning double-leaf bascule bridge section that can be raised to let ships pass under the bridge. The railway bridge historically carried meter-gauge trains on it, but Indian Railways upgraded the bridge to carry broad-gauge trains in a project that finished Aug. 12, 2007. Until recently, the two leaves of the bridge were opened manually using levers by workers. About 10 ships — cargo carriers, coast guard ships, fishing vessels and oil tankers — pass through the bridge every month. As per chronicles of Kutch Gurjar Kshatriyas mentioned in their book - Nanji Bapa Ni Nondh Pothi. The erection and construction of Pamban Bridge was done by Mistri Manji Daya with Lakhu Devji both of Anjar and Gangji Narayan of Khedoi. 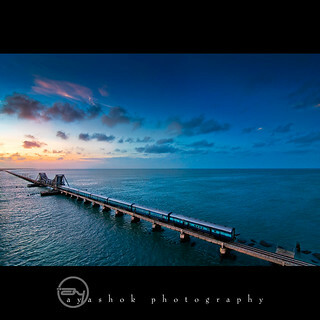 Together built the Railway lines and Pamban Bridge over creek of Rameshwaram to Pamban construction of which they started in year 1887 and completed in around 1910. While working on Pamban Bridge the Mistris Lakhu Devji Vegad of Anjar and Gangji Narayan of Khedoi also built famous Temple of Neel-Mandir having seven domes at Rameshwaram, construction which, they started in 1899 and completed in about five years by 1905. The bridge is located at the "world's second highly corrosive environment", next to Miami, US, making the construction a challenging job. The location is also a cyclone-prone high wind velocity zone.